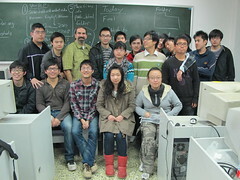 This was my last day teaching in Wuhan. Tomorrow I take care of paperwork with the University and head to the airport after tidying up my stuff. The students were wonderful! Some even came by my hotel room offering gifts and well wishes. It was so thoughtful and kind. They are a great group! I really enjoyed teaching in Wuhan and the students are the reason.